I have had this table for about 5 years, and have used it in many rooms in my home, most recently as an end table in my living room. I paid $4.99 for it at Goodwill, and have not done a thing to it until now. Except dust it. I have dusted it a few times. I already have quite a bit of black in my living room, so I wanted one piece that complimented the black, but popped a little. 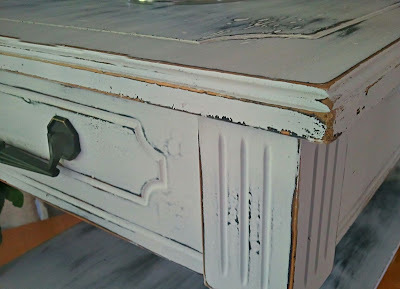 I have read a lot about chalk paint but I already had some Krylon Flat Spray Paint in White. So, being the cheapie that I am, I thought I would give it a try. 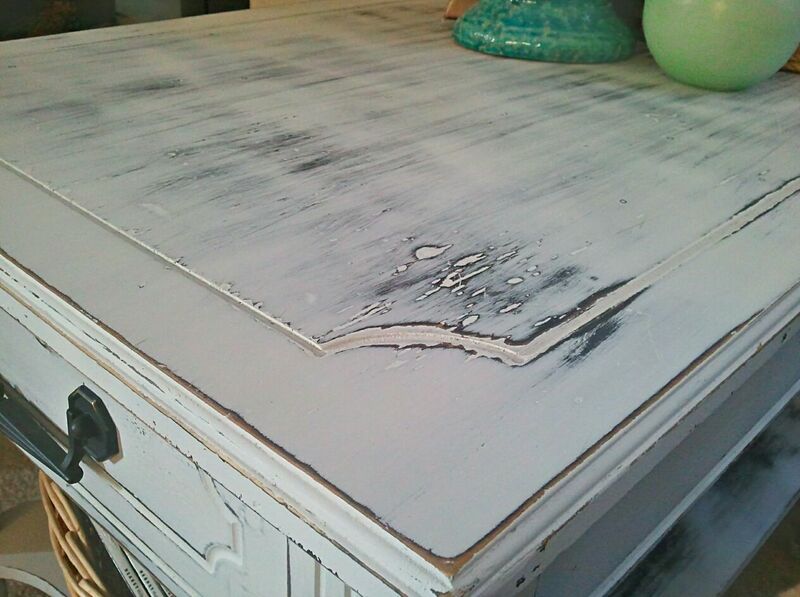 I applied a few coats, and the paint was chalky when it dried so I was kind of excited. This may just work!! I used a fine grit sandpaper and went to town. 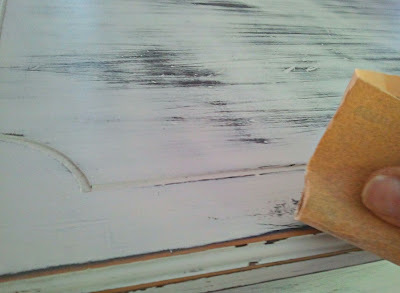 The only way you can really mess up a distressed piece is to sand too perfectly, or not enough. Get wild, just go with the grain of the wood. Ooooh, I’m having fun now. I am covered in paint, and she is really beginning to look super shabby! I hope this brings you some fun ideas on ways to use what you already have or find pieces on the cheap and make them fabulous. And the great part is my kiddos can bump into it, spill on it, and it will still look oh so shabby and lovely. Hi Tanya! 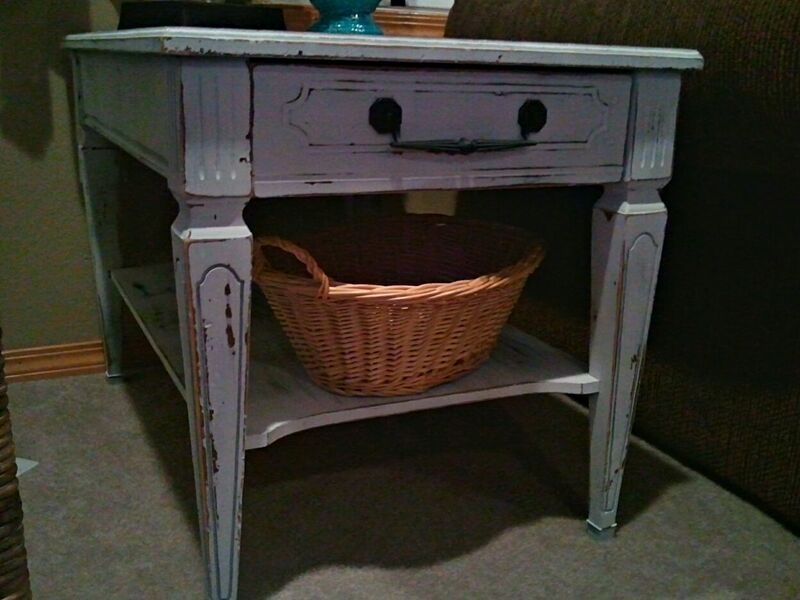 Love your endtable, I found one at GW too and it was 6.99, I used homemade chalkpaint on it but didn't scruff it up yet! Thanks for stopping by and I'm going to find your follower thingy and join in! I love how that table came out. I'm a bit afraid of distressing,I feel like I'm going to mess it up. You made it look easy! Hi Tanya, hard to believe this was done with spray paint. It's really wonderful, you did a great job! thanks for linking up with VIF! I love shabby projects! I just found your blog from the party and will follow it to see what other great projects you have. 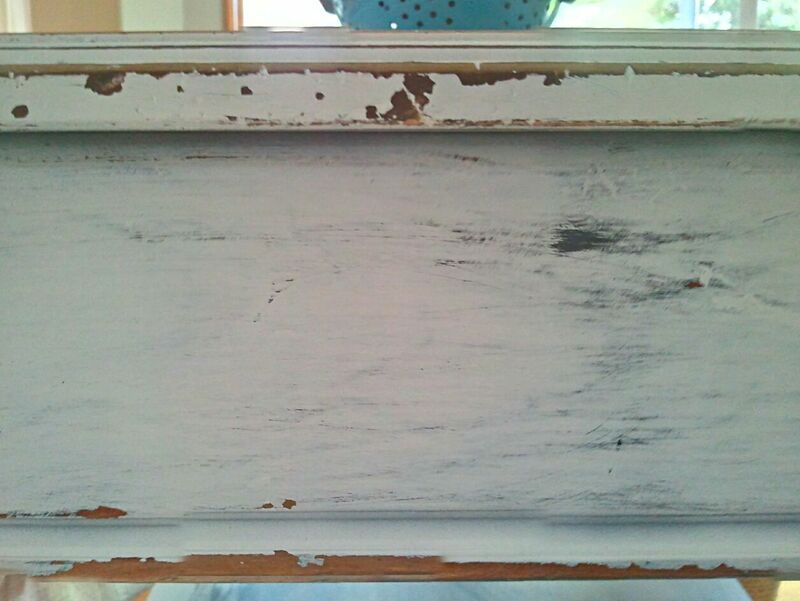 I just finished a shabby window project myself. Your table looks great! You're good at distressing! this is beautiful! i love it so much! thanks so much for linking up to the party this weekend! Sharing Shadymont, thank you very much! I am glad you hopped on over to my blog today, Happy Creating! 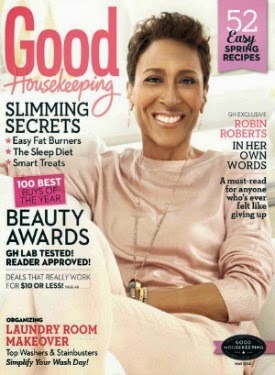 Lauryn, Thank YOU for hosting, love your profile pic, very chic! That's one great looking table. I am taking your advice and going wild with the sanding. I had been holding back before but no more! This table turned out amazing! I love the makeover! Thanks for coming by Georgie Emerson Vintage! Really enjoyed my visit here….I'm your newest follower! I'm a cheapy too and love that you achieved this with spray paint! I love it! Great job…and yes, the price is right. Stopped by from Debbiedoo's and so glad I did. I'm a new follower and look forward to more of your projects. Thanks for commenting over at Sweet C's! Your blog is adorable- and I am LOVING this table! You did a fantastic job. And great accessories! This transformation is wonderful! Just love how it turned out. Just the right amount of paint and distressing! The transformation of your little table is amazing! Even better that it was accomplished with spray paint and distressing. I'm not a big fan of painting furniture by hand. One day I will work up the courage to try a homemade chalk paint recipe. Oh you did an amazing job. The table looks so pretty. Glad to have discovered your blog!! I know what you mean about going overboard…that's usually my problem too. Your table came out perfect. Darling blog! Love it! Thanks for stopping by earlier! I'm your newest follower! It's perfect Tanya! 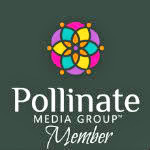 Thanks for following, I'm now a follower of your blog as well! You're good at distressing…I have yet to master it…maybe I don't go wild enough… 🙂 Anyway…great job! 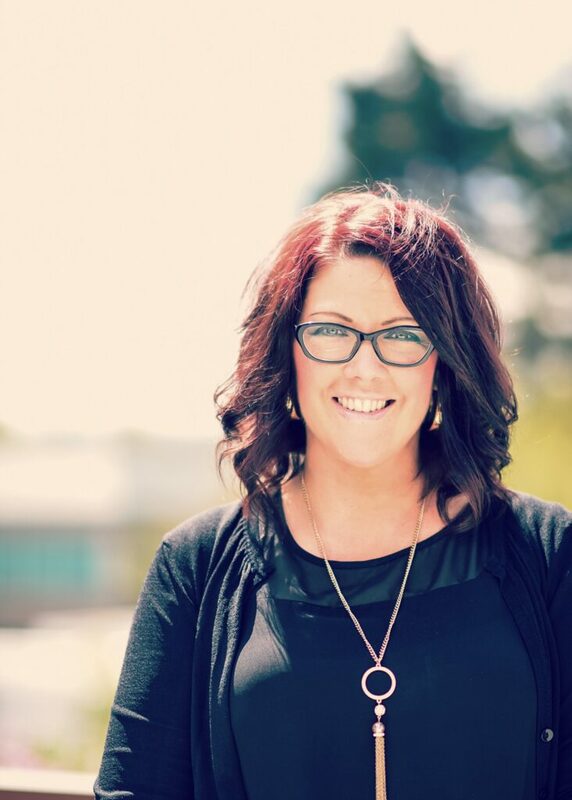 Hi Tanya…thanks so much for sharing with the newbie party. You are a true talent and did a fabulous job on this piece. What a great table! I love a good find and it is even better if you make it better yourself. Thank you so much for coming over to visit my blog! I hope you try the banana cake. You will love it. Hi Tanya. Your upcycle turned out wonderful. It makes me want to go out and find something new to re-do. I found you over at Mod Vintage Life and now I'm a new follower. I can't wait to read more and see your next creation. That looks great, Tanya! I love remaking pieces I already own. I feel like I'm get something new but it's free! What a GREAT transformation .. shabby chic lovelyness! Gorgeous finish! Love all that distressing! Love, love, love your table. 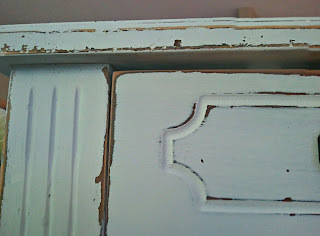 I'm always distressing something, even my kitchen cabinets! I'm visiting via Ivy Cottage's Cowgirl Up linky party and am your newest follower. The table turn out so marvelous, Tanya. I really enjoyed each photo. Thanks for the sharing! I love the end result!! but what I love even more is that you used spray paint!! Thanks! Hi Tanya! 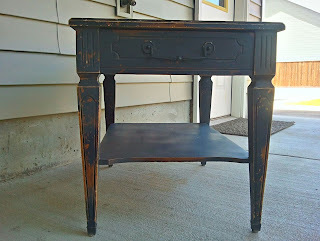 Visiting form the comment you left over at my blog:) Your end table turned out great! 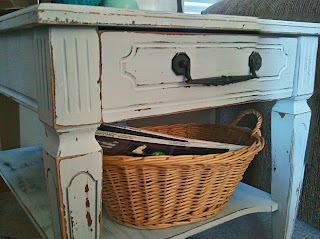 I have yet to transform a piece of furniture but I do transform my thrifty finds, to answer your question. 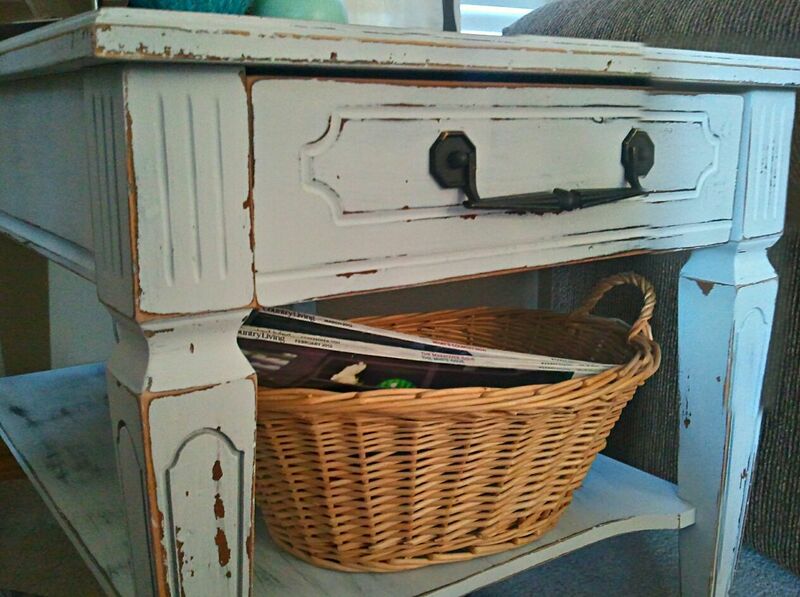 I keep seeing so many great projects like yours around blogland so maybe one day I'll give a furniture upcycle a go. 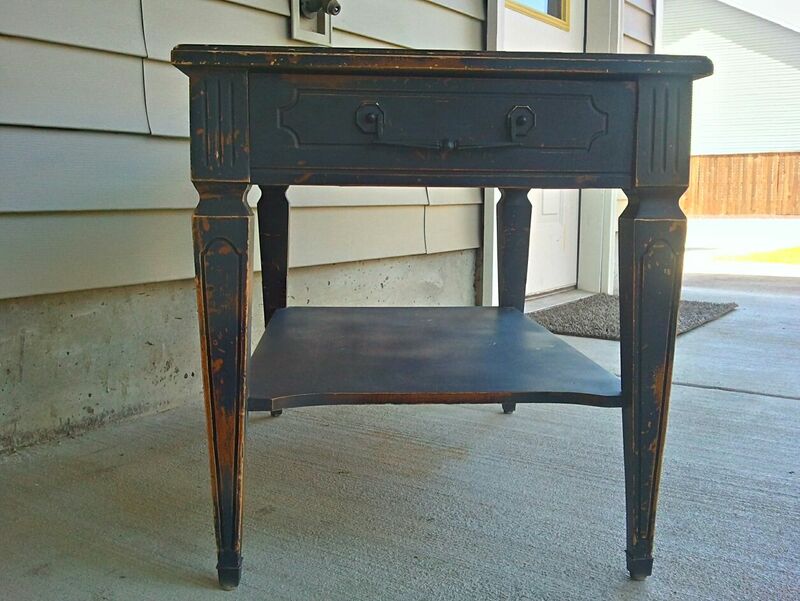 I love what you did with this side table, Tanya. Really nice work. I found you through Debbiedoo's Newbie Party. I'm your latest follower and a fellow newbie. I hope you'll pop by and see me sometime. I love what you did with this side table, Tanya. You do lovely work. I found you through Debbiedoo's Newbie Party. I am your latest follower and a fellow newbie. I hope you'll pop over and check out my place sometime. Such a cute "new" table. I am in LOVE with that vase. It's so pretty!!! Love how your table turned out. I never would have thought spray paint would have worked but it looks fantastic. Thanks for stopping by Simple & Sweet Fridays, I'm a New Follower too! Hi Tanya! Thanks for visiting my blog today and for your sweet comments on my DIY Sharpie French Label Towel! I wanted to reply to your email, but I couldn't because you are a 'no reply blogger' which means that when you leave a comment on another blog, that blogger can't reply to your comments. But don't worry, its easy to fix with a small change to your profile settings! Absolutely gorgeous! I love the color you chose! What a great new piece to have! I love your little table! Thanks for following me….now I'm following you!!! Newest follower here! I'm loving your posts – I'm a wanna be diy'er. Followed you over from your sweet post. What a pretty table you have made this and you can't beat the price! This turned out so nice! THank you for sharing at our Handmade Tuesdays party! Hi, it's Marsha over at Every Little Birdie. Thanks for visiting my blog. I popped over to yours and am now your newest follower! 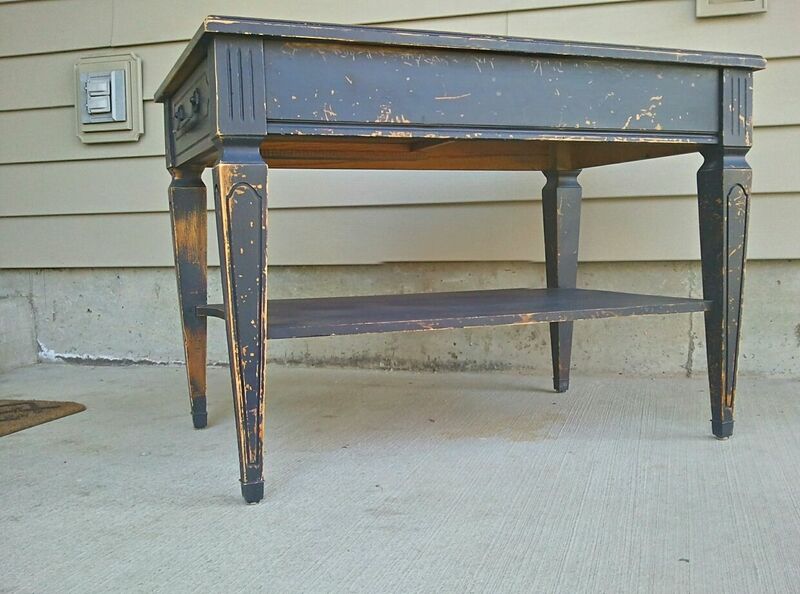 Love your blog and your beautiful "new" table. So nice! I just picked up a table at Goodwill today; you've inspired me with some great ideas, thanks! 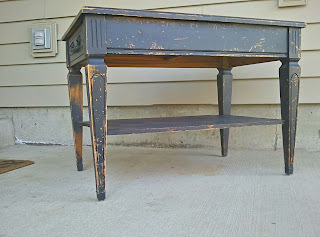 Goodwill is my favorite place to shop….you made a great table even greater! Thanks for stopping by my blog today and for following me. Right back atcha! Love the table! I have found that it can be easy to get carried away with the sanding! I'm following you now! Love your table! Also, so happy to have you as a new follower. Thanks for your kind comment on my office makeover! Love the table makeover. Amazing what you can accomplish in an hour with a can of paint and a brush. GREAT JOB. Im now following you. Please come visit me at PICKINandPAINTIN.blogspot.com and maybe you'll follow back? THANKS. that table looks fabulous- love the layered look! Your table makeover is awesome! What a fab makeover! I love how it came out! I would have tried the spray paint first too. 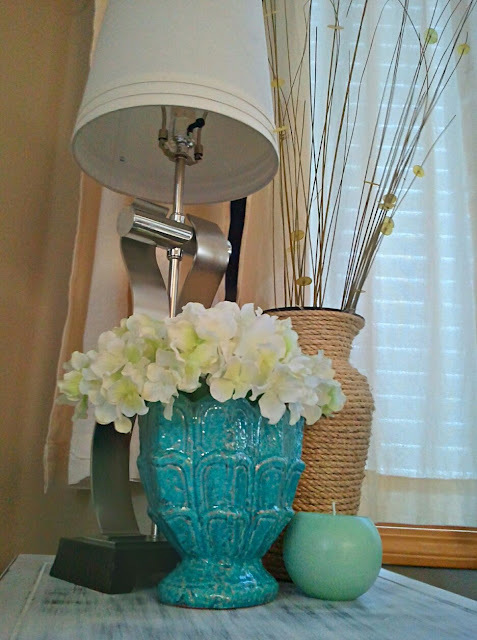 It's always nice to do beautiful things like this with things you already have around your home. Thanks again for passing by my blog and following! I am now following you. I'd love for you to link up this amazing table to my party today. SUper charming~ love how it turned out! Thank you for linking up at Feathered Nest Friday! Beautiful table! You've been featured for Functional Friday! Thanks for linking to the French party! Come back Monday! It looks fabulous!! 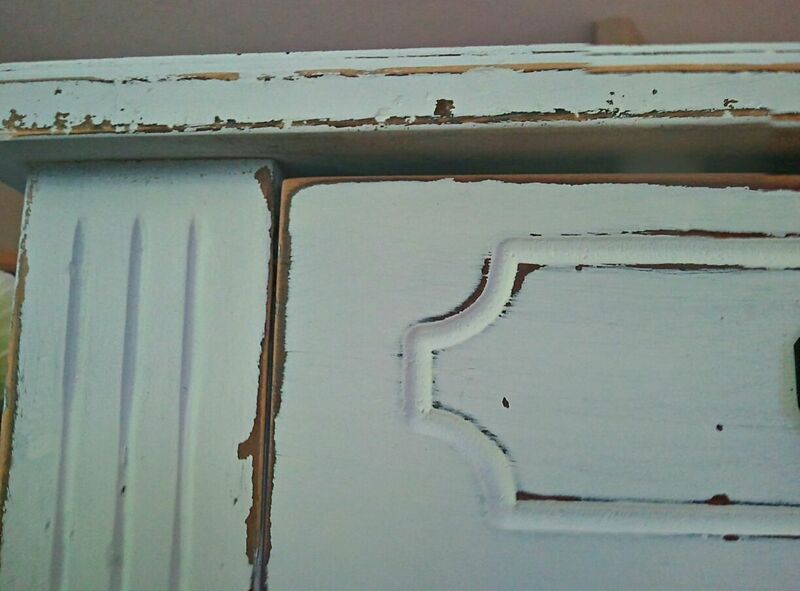 Great job on the distressing. Who knew you could get such a great shabby look with spray paint! Thanks so much for linking up to The Creative Spark. I'll be featuring this on my Facebook page. Have a great weekend! This is gorgeous. Aren't you glad other people can't see what you saw in this piece? Their loss is your gain. Thanks for sharing this week on BeColorful. Love how you can see all the details now! Really pretty! … I have a table almost exactly like it too! This is such a great piece! You did a nice job! Thanks for visiting me and following! I'm your newest follower, too! I love your table! Great job! I am a new follower. Hi! 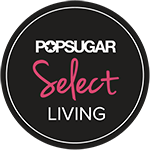 I also wanted to let you know that I am nominating you for the Versatile Blogger Award! Congratulations! Hi, this is GREAT. I am your newest follower over from the blog hop. You are definitely my favorite new follow today. I am a momma and a DIY'er as well. I hope you get lots of new followers today and really have a great week. This is fabulous Tanya! GREAT job!